Adair’s Demolition has over 40 years’ experience in the industry. They are located 30 minutes North of Regina, Sask., in the community of Southey. Since their incorporation in 1976 they have gone from operating a cement plant to providing quality demolition and excavation services as well as hazardous materials abatement. They are a fully bonded and carry extensive demolition and hazardous materials insurance. 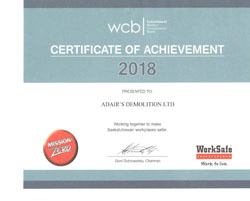 The number one priority at Adair’s Demolition Ltd. is safety. We are a member of the Saskatchewan Heavy Construction Association. 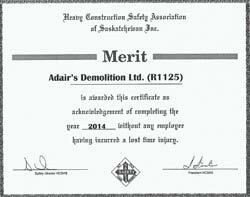 We understand the importance of safety health regulations, Adair’s Demolition takes rules very seriously. We know that safety is more than just a priority and is in fact inspected and regulated. Demolition is a specialized industry that involves working in dangerous environments with hazardous elements. To prevent accidents, we adopt a zero incidents safety plan that helps us understand all the possible risks and prevent them with the right precautions. We provide all our employees with extensive training in health and safety regulations and take additional measures to keep up with the latest safety procedures and ensure the implementation of them. Each member of our team has completed thorough training to operate all of our demolition, excavation, and abatement equipment. We have a commitment to safety, positive attitudes, and teamwork. We can provide turnkey packages for demolition and abatement.